Gonna add it in the OP! Wow, it sure gives us some perspective… this light is really compact ! And I like that sanded finish, I hope the final model will be exactly the same as in this pic ! That does look like a great design. Lots of function in such a small package. The clip will make it even more functional and easy to stash on your person. It looks close to the size of my Zebralights. 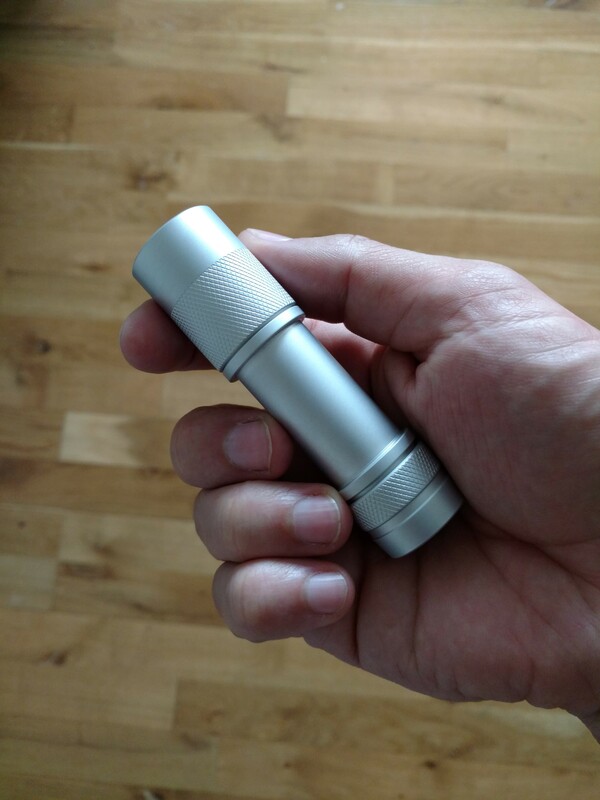 I initially thought it was going to be more along the lines of an Astrolux S1, but the shorter length will be great. Yeah its almost a 18650 light in 16340 size! I do like the clean look of the light and wouldn’t want anything on it, however I totally love the idea of having a logo of some sort (in tfl some people argued for a TFL/BLF Logo on it) or an atypical pattern (in contrast to the clean look) on that inner tube. Don’t know how much trouble (and cost) that would be, but if that is easly done please go for it! I second the idea of engraving. It was done for the $7 BLF 348, so I’m sure cost is not an issue. There can be the choice of engraved and non-engraved versions like the BLF 348. Light looks great, put me down for one! Thanks. But it cannot conduct or be higher then the rest of the tube (or maybe it would prevent the inner tube from falling out in which case it has a function as well. No, all the laser etching does is delete the dye used for anodizing, to make a contrasting color of the aluminum underneath. I think even the anodizing itself is left intact. I know I have no place to comment here. The design is finished, tested, and decided on. Buyers will buy and everyone else will not, and that’s okay. But, I have to offer just one piece of unsolicited opinion, because it’s sometimes just who I am. The valley between the head and tail could use a little softening. If those square-cut shoulders were cut to a double-radius (an S shape) instead of hard 90 degree plunges, it would look a bit more friendly. I imagine it would also feel more friendly, holding it in hand. Since these are being turned on a lathe, I’m guessing it wouldn’t be a huge change for the work-flow. Anyway, like I said, don’t listen to me. This is not my project. I have no say. Carry on! No worries, we are always happy to receive some input! When designing the light I thought about different ways to shape the body and there are a few reasons why I went for the way it is now. Similar to your suggestions I actually considered to make the body round like for example the Lux-RC FL33. But since there are no other round shapes on the light I dismissed this idea. I could have added some more round shapes (at the tailcap or the bezel) but then it would have been a quite different design and that just wasn’t what I was going for. I also considered to make a chamfered transition but firstly I didn’t want it to look too much like an HDS light and secondly I really wanted the design to be as simple and basic as possible without adding too much weight. And so I ended up with those straight lugs. But if more people feel that way we can of course talk about changing it. I’m with David on this one, it would look better if those shoulders (and perhaps the end of the tailcap) were chamfered so it’s smoother for cigar grip and aesthetics. I originally thought that was the design based on the first photo. It doesn’t have to be a long slope like the HDS. I’d also like to see more aggressive knurling so it’s less likely to slip from the hands. laser engraving doesn't add any material. It won't conduct either if the anodizing is done after the engraving. If you laser-engrave something after anodizing it, the oxid layer is destroyed. This means, that the engraved area will conduct again. Since we don't use any dye for the anodizing the engraving will be hardly visible. (and in a few hours CRX posts another super light made with brass, magnets, charging in an elegant design) you sir are one of the people making me want a FW3A for it seems the only way for me to get something so nice and beautiful as you guys (yeah looking at Dale, PP, MRsDNF and others as well ) present so often! Design is Fritz, if he is OK with chamfered edges it can be done. It is his design, period. I really get excited to get a text on the inner tube. It is there but only if you look, oozes eye for detail. Fritz what do you say? If it means more work and time and possible miscommunication to get this light laser-ized, I say “less is more.” More lights in my hot little hand! No need for engraving in my point of view. I’m interested! Please put me on the list ! Several meanings for the same word. Cooperation meant like in made by TLF in cooperation with BLF? And designed by, do you mean the whole light, or just the design itself? I’d agree. Keep it simple! Count me in for one! A beautiful woman should not wear too much jewelry (she is not a christmas tree). Interested, please put me down for one. I would like this light as simple as this. Without any additional logo or text. The idea was a logo or text on the inner tube, not visible on the outside!